1 Ingelesez: “Nothing better reflects the muddled thinking of the mainstream European left than its stance on Brexit. 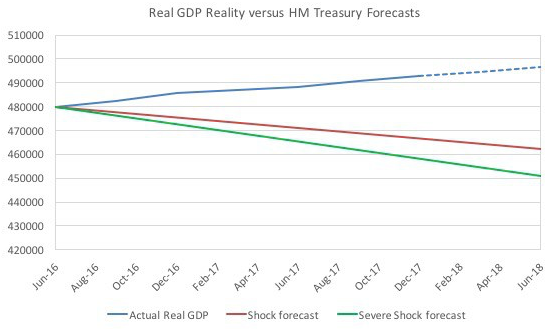 Each week seems to produce a new chapter for the Brexit scare story: withdrawing from the EU will be an economic disaster for the UK; tens of thousands of jobs will be lost; human rights will be eviscerated; the principles of fair trials, free speech, and decent labor standards will all be compromised. In short, Brexit will transform Britain into a dystopia, a failed state — or worse, an international pariah — cut off from the civilized world. 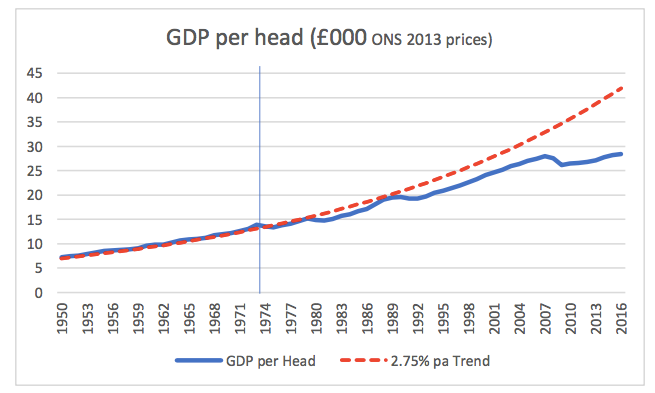 Against this backdrop it’s easy to see why Labour Party leader Jeremy Corbyn is often criticized for his unwillingness to adopt a pro-Remain agenda. 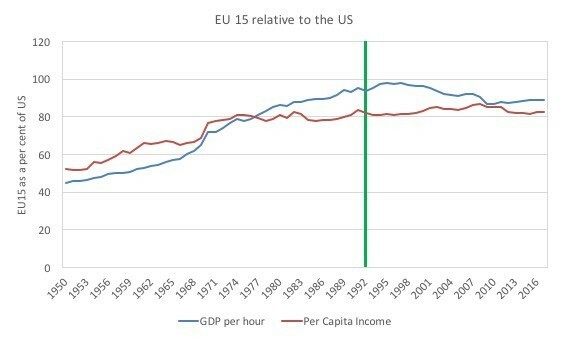 11 Ingelesez: “The data clearly shows that not only has the Single Market (starting at the green line) failed to improve the EU15 economies relative to the US, but would actually appear to have worsened it. 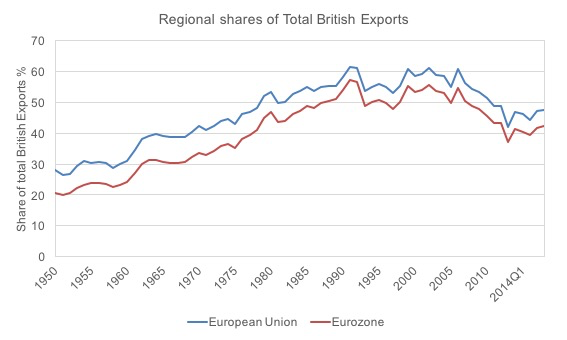 12 Ingelesez: “As the Cambridge researchers note, this suggests “a negligible advantage to the UK of being a member of the EU.” Moreover, it shows that Britain has been diversifying its exports for quite some time and is much less reliant on the EU today than it was twenty or thirty years ago. A further observation drawn from the IMF Directions of Trade database is that while global exports have grown fivefold since 1991 and advanced economies exports have grown by 3.91 times, EU and EMU exports have only grown by 3.7 and 3.4 times respectively. 14 Ingelesez: “So why does the mainstream left have such a hard time coming to terms with Brexit? 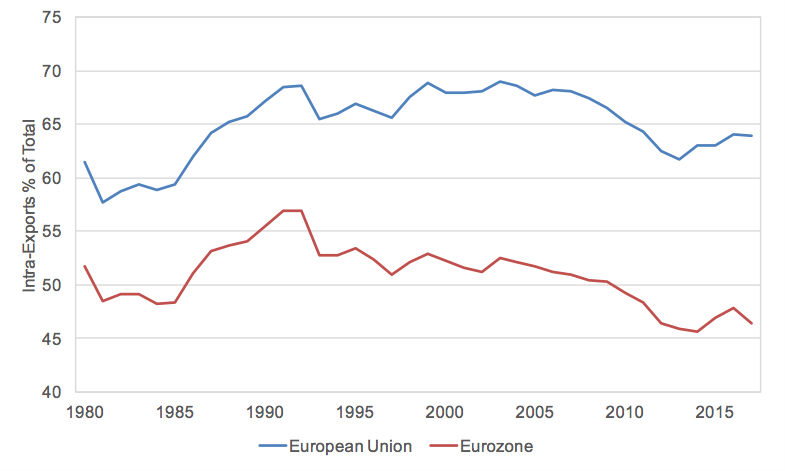 The reasons, as we have noted, are numerous and often overlapping: the Left’s fallacious belief that “openness” and trade bring prosperity; its internalization of mainstream economic myths, particularly concerning public deficits and debts; its failure to understand the true nature of the Single Market and of the European Union in general; the illusion that the EU can be “democratized” and reformed in a progressive direction; the flawed notion that national sovereignty has become irrelevant in today’s increasingly complex and interdependent international economy, and that the only hope of achieving any meaningful change is for countries to “pool” their sovereignty together and transfer it to supranational institutions.